Sciblogs | How old is behavioural economics? I came across an interesting paper the other day that suggests behavioural economics is older than most people think. 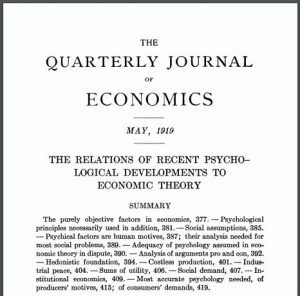 The paper “The Relations of Recent Psychological Developments to Economic Theory” by Z. Clark Dickinson in The Quarterly Journal of Economics, Vol. 33, No. 3: 377-421 dates from May 1919! The purely objective factors in economics, 377. – Psychological principles necessarily used in addition, 381. Social assumptions, 385. – Psychical factors are human motives, 387; their analysis needed for most social problems, 389. – Adequacy of psychology assumed in economic theory in dispute, 390. – Analysis of arguments pro and con, 392. – Hedonistic foundation, 394. – Costless production, 401. – Industrial peace, 404. – Sums of utility, 406. – Social demand, 407. – Institutional economics, 409. – Most accurate psychology needed, of producers’ motives, 415; of consumers’ demands, 419. And so our tentative conclusion is that an accurate knowledge of the psychology involved in economic behavior is needed in economic theory, not so much for static as for dynamic purposes. It is needed for static theory if we want to be assured that our static theory is as complete and fundamental an explanation as the existing state of knowledge permits. But it is vital for dynamic theory, which looks beyond the existing conditions of wants, social structures and industrial devices, and prophesies what would be the result of various supposed innovations, if they were made. In this same fashion we have long predicted the probable results of hypothetical taxes and tariffs on production, distribution, etc. If we can set up hypotheses as to ways of changing consumers’ demands, or producers’ springs to action, which psychological science shows to be plausible, and trace their effect on economic life, we shall be adding to the purely scientific theorems which the legislator or reformer may find helpful. And aside from the possible applications to pure economic theory, such knowledge of motives is bound to be useful in the practice of social art.